Paddle a six or ten mile section of the beautiful Housatonic River in Northwestern Connecticut. 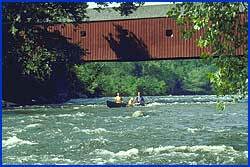 The famous Covered Bridge in West Cornwall marks the halfway point and is a nice place to have a picnic lunch (no glass bottles please! ), or stop at one of the many scenic spots along the river. *Available in our retail store. All rates include shuttle service & lifevest. Our vans leave our shop to bring you to the river at the following times. PLEASE ARRIVE 20-30 MINUTES PRIOR to shuttle departure. Pickups are every 1/2 hour throughout the afternoon. Advance reservations (1-2 weeks) are strongly recommended (earlier for large groups). We require a 50% reservation deposit to confirm your reservation. This may be done over the phone with a credit card if desired. Reservation deposits are fully refundable with 5 days cancellation notice. In case of rain, you may transfer your deposit to another day. A Security Deposit of $50 or a credit card is required at the time of rental. When rented equipment is returned, in signed-for condition, security deposit may be picked up. Clarke Outdoors reserves the right to cancel or move any trip due to river or weather conditions. We will not rent to persons who appear to be under the influence of alcohol.